Friday January 29th 1892 I only stopped talking with Lizzie long enough to help Josie a little with the work and get a bit of dinner. Will took us over to Hatties to spend the afternoon. he spent the evening at home with us girls. Saturday January 30th 1892 Will took Lizzie home this morning. I was busy with the work all forenoon and in the afternoon Will took me over town I spent the afternoon at Hatties. I read and wrote in the evening. weather pleasant. Sunday January 31st 1892 I let Josie to to early church and Will and I went to hear Miss Chapin preach. It is eighteen years since she was here. I was reading all afternoon and expected to go to church in the evening but it looked too much like rain. The folks were all at church this morning and did not come over home in the afternoon. Monday February 1st 1892 It looked like rain but we washed and it cleared of so the clothes got dry and I ironed some. Josie did some scrubbing in the afternoon. We made a full day of it. Tuesday February 2nd 1892 I helped with the work and got the ironing done before noon. Will helped me across the road and I went out to Marys to spend the afternoon. I am working on lace for Hattie. 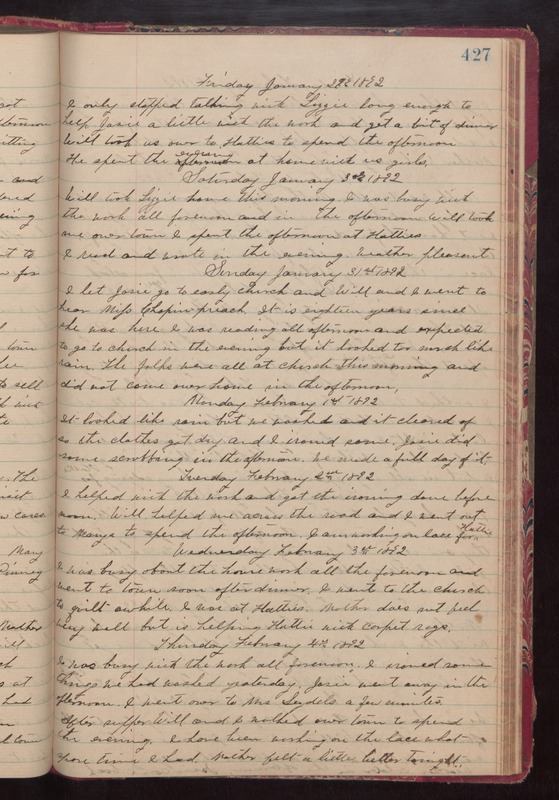 Wednesday February 3rd 1892 I was busy about the hosue work all the forenoon and went to town soon after dinner. I went to the church to quilt awhile. I was at Hatties. Mother does not feel very well but is helping Hattie with carpet rags. Thursday February 4th 1892 I was busy with the work all forenoon. I ironed some things we had washed yesterday. Josie went away in the afternoon. I went over to Mrs Seydels a few minutes. After supper Will and I walked over town to spend the evening. I have been working on the lace what spare time I had. Mother felt a little better tonight.